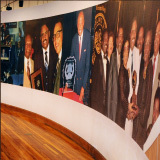 Dr. Frank G. Pogue, President of Grambling State University, and his wife, Mrs. Dorothy Pogue have donated a beautifully framed print to the Museum - by the artist Charles Bibbs. This artist choose deep, dark luscious color to bring this painting to life. You get a sense of the man as well as the Coach. This work of art is up for viewing. Thank you to the entire GSU Family!